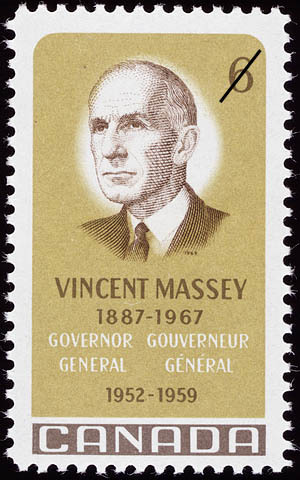 The value of a Vincent Massey, 1887-1967, Governor General, 1952-1959 - 6 cents 1969 stamp depends on several factors such as quality and wear, supply and demand, rarity, finish and more. Values in the section are based on the market, trends, auctions and recognized books, publications and catalogs. This section also includes information on errors and varieties and characteristics. Mr. Massey, Canada's 18th Governor General since Confederation in 1867, was the 1st native-born Canadian to serve in that high office; he assumed his duties as personal representative of the Queen on February 28, 1952 and continued until September 15, 1959. Traditionally, the Governor General of Canada, appointed on the advice of the Prime Minister, serves a term of 5 years; the distinction with which Mr. Massey acquitted himself resulted in an extension of his term to just over seven years, the longest of any person in such a capacity. His precedent shattering selection as 1st Canadian born Governor General had been preceded in 1926 by his appointment as the 1st Canadian Ambassador to the United States of America. Born in Toronto, Ontario, on February 20, 1887, when his fledgling native country was barely 20 years old, Mr. Massey lived to enjoy all but a few hours of the nation's historic Centennial year; his death occured on December 30, 1967. At one time the President of an industrial enterprise bearing his name, Mr. Massey was active in divergent fields. During a tenure as teacher of modern history at the University of Toronto, an Institution he was later to serve as Chancellor, he supervised the building of Hart House, a gift from his family to the rapidly expanding seat of higher learning. In the 1914-1918 war he served as a staff officer in Military District 2 and later as Associate Secretary of the War Committee of the Cabinet; during the Second World War he was contributing his diplomatic skill and knowledge as Canadian High Commissioner in London. In the same period he was a member of delegations to the League of Nations and to the United Nations Assembly. With an acknowledged intelligence, integrity and a devotion to the beauty and truth of life, Mr. Massey gave outstanding encouragement to his fellow-countrymen in the cultural development of Canada. As Chairman of the Royal Commission on the National Development of the Arts, Letters and Sciences, culminating in the remarkable Massey Commission Report of 1951, he did much to provice wise counsel to successive generations. In a lifetime of widespread travel throughout Canada as industrialist, educator, writer, politician, administrator and diplomat, Mr. Massey was profoundly affected by what he referred to as "- natural beauty everywhere for those who have eyes to see -". His intense interest in his native land and her people took him to the most remote settlements from Haida villages in the Queen Charlotte Islands, to Arctic Eskimo settlements and to outports on the Newfoundland coast. Of his journey as the first Canadian Governor General to fly over the North Pole Mr. Massey wrote: "I found it an experience as humbling as it was fascinating". An admiration and respect for all peoples of Canada is evident in his confidant's knowledge that he liked nothing better that time spent in the official periods of residence at the Citadel in Quebec. Some 6 weeks before the end of a life laden with well-deserved official and academic honours Mr. Massey had the signal honour of being among the first Canadians to be invested as Companion of the new Order of Canada.